Below, see my fractions ebook. 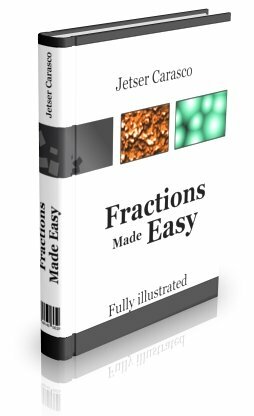 The book offers a deep and thorough coverage of fractions with lots of illustrations to enhance understanding. My affiliate program is run by ClickBank and it will pay you 50% commission to you for each sale, netting you + 12.91 USD just for putting up your own affiliate link to my sale page! ClickBank is one of the many payment processors available on the web yet Clickbank is the largest distributor of e-products online and it is my #1 choice. They process all orders and pay me when customers buy my ebook. To signup as an affiliate and get start earning money, CLICK HERE and just follow the instructions! Remember that all clickbank products are digital products. This means that they can be downloaded instantly. Alternatively, you can sign up at the affiliate Scout to promote my product. It is also a very good program!